The view from the Clifton Downs of the dramatic Avon Gorge, now a residential part of Bristol. In the late 18th century, Clifton was known mainly for its spring. In 1686 the Society of Merchant Venturers bought the manor of Clifton, and sold then sold a 90 year lease to two of its members to develop the spring. Several improvements were made including building a pump to raise the water, a Hotwell House and a new road to make access to the spring easier. 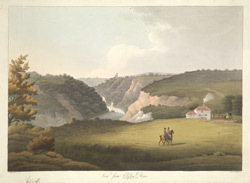 As this print shows, Clifton was one of the most scenic parts of Bristol.